Got bored today and decided to knock this one out. Got to the trail at 3:30pm and started a little bit above the lowest parking area. There were so many paths to the top, I ended up doing some hybrid that was very steep and strenuous, but I made it. Took 75 minutes to get to the summit, 45 to get down. Armando Silva on Got Really High on 4/20…10,834 ft to be exact. What's on your day hiking gear list? 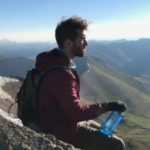 Registered, but cannot log your hikes? Camping on top of Mt Wilson?